In today’s business world, two things that need to be successful are saving money by cutting down on unnecessary spending and keep up with the latest trends in terms of technology. You might think how it is possible to cut down business spending while keep up with the high tech trends. The answer is simple. You can use machines in good working condition at discounted price. Second hand Photocopy machines are excessively used in large number of offices. They work as good as new because their faulty parts can be replaced with new one. Businesses are saving large amount of money by purchasing second hand photocopy machine for their office use along with fulfilling their business needs efficiently. There are various brands that companies are purchasing from sellers of used machines. Canon is a famous brand that has good features, speed and efficiency. Second hand canon copiers are available at various stores. You can purchase second hand photocopy machine of canon as it is reliable. There are many other bands that work efficiently. Second hand photocopy machines have grown in popularity as they are cost effective and environmental friendly. Before purchasing a photocopier, you can check the performance, color printing and other features. Check all features before buying a used machine in order to get an older machine in full operating order. Before buying a second hand photocopy machine, it is good to determine how long the product has been in use. Check that the essential parts of the photocopier have been replaced or serviced as needed. You should check cleaning blades, drums and the toner. Finding the Model numbers of photocopiers is a good way of finding the age of used copiers. It is important to consider the kind of ink or toner used in the copier. It is possible that you may be buying a copier whose toner or ink is no longer available in the market. Another type of copier is refurbished one. This type of copier has replaced parts and properly serviced, as a result, they can work efficiently. Make sure the refurbishment is done by someone reputable. Ask from the person you are buying the equipment about the refurbishment process to know whether the equipment is properly cleaned or not. New models have additional features and are more environmental friendly. They have multiple functions in a single machine as a result; they occupy less space and provide efficient results. A lot of second hand photocopy machine providers are available all across the globe. It is important to choose a reliable company. 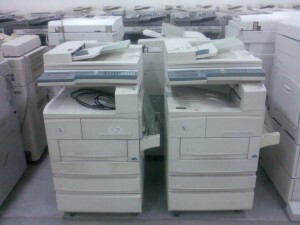 We also provide second hand photocopy machines at affordable cost. These are in good working condition. We have a stock of high quality branded used photocopiers. Many companies are using used photocopiers of our store and are getting great benefits from them. If you want to get quality products, contact us today.